Another victim in the Cagayan de Oro blast that occured Friday night has died. The death toll in the CDO bomb explosion has climbed to 8. The latest fatality was identified as 46-year-old Dr. Marciano Agustin, a member of the Philippine Medical Association who attended the national convention there. The CDO blast took place between Kyla’s Bistro and Candy’s Café located at Rosario Arcade in Limketkai Center last July 26. Most of the victims were doctors and medical representatives who attended a conference at the Grand Caprice hotel, also situated within the mall premises. Three died on the spot while the rest were rushed to Polymedic Velez Hospital, Polymedic Plaza Hospital, and Capitol University Medical Center for treatment. Authorities identified some of the casualties as Dr. Erwin Malanay, Emmanuel Falafox, Anthony Cañete, Ryan Estoese, Misamis Oriental SP member Roldan Lagbas. The most recent is Dr. Agustin. No group has taken responsibility for the attack. 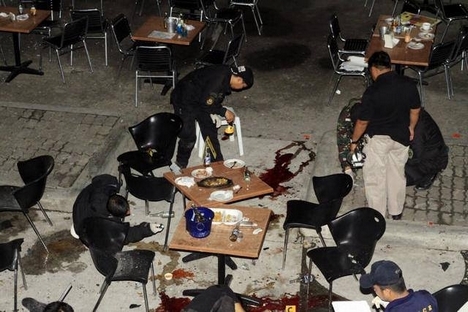 The motive behind the Cagayan de Oro blast is being investigated. The principal target is not yet clear.